Fooditka: Sparrow - Reyes Knows Best! Sparrow - Reyes Knows Best! Sparrow is the epitome of a neighborhood establishment. Located directly across the street from the Bohemian Hall and Beer Garden, it's surprising how much this place stands on its own. And most unexpected of all is that it serves great food! Walking into Sparrow, you'll probably think to yourself "Hmmm...a bit dark and gothy yet pretty cool and cozy." It's true that this place isn't for everyone but if you come here with an open mind, you're bound to appreciate it. There are many interesting and artsy touches throughout--the old school cash register, art deco lighting, vintage wallpaper and bench seating. The music mix is eclectic, ranging from 80's and 90's hits to indie rock. The kitchen is still relatively new but already capturing a steady and loyal crowd. The most interesting and humorous part of your dining experience will be the chef--Reyes! This talented Mexican chef has selected his menu of inventive dishes straight from the heart and he takes it very seriously. By this I mean that what you see is what you get--NO substitutes. So if you see a fontina cheese and tomato sandwich on the menu, you will get just that, no mozzarella to swap out! Aside from Reyes' peculiar attachment issues, his dishes are certainly worth trying. Click for menu. 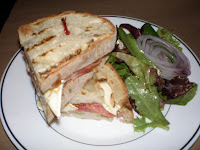 The sandwiches have a special twist to them and I'd suggest trying the prosciutto and brie sandwich with onion jam. The bread is grilled to perfection and the prosciutto, brie combo is luxuriously smooth. Another good option is a burger--any kind! They're big, hearty and come with your choice of spicy or herb fries--both are good but the spicy are my favorite. 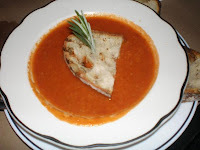 Recently, I had a tomato tortilla soup that I loved. While it had a definite kick--sensitive mouths, watch out--it had so much flavor and was served so beautifully, that it earned my seal of approval. For the most part, the service here is quite good. On occasion, I've had a surly waitress but this is not the norm. Usually, they're pleasant, chatty and animated--some even do funny dances. Your dishes and drinks will come out on time and you won't get stuck waiting for the check. The prices here are pretty average--$7-$9.50 for a sandwich, $6.50 for soup, $3.50-5 for sides. REYES KNOWS BEST! I mean, I could understand if he trained at the French Culinary Institute...but do not mess with this guy!! 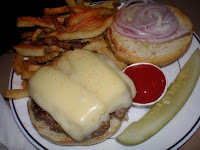 I was just at Sparrow last night and had a wonderful burger. I mean, I know the burgers there are great but this was outstanding. Had the herb fries, but I do like the spicy ones, too. My friends ordered some grilled bread and it was amazing! Love this place and am so glad it's here in the neighborhood! Cool Meg, glad that you had a good experience there. The next thing on my list is to try Sparrow's brunch. I'll report back soon but I heard from others that it rocks! Yeah, I heard brunch is terrific there. I've been meaning to try it myself!